At Black Diamond we are proud of our reputation of offering superb products at highly competitive prices. Our range of 500ml retail products offers vehicle owners at home a comprehensive range of award winning products and accessories for both the interior and exterior of their vehicle, and is ideal for the beginner and professional alike. 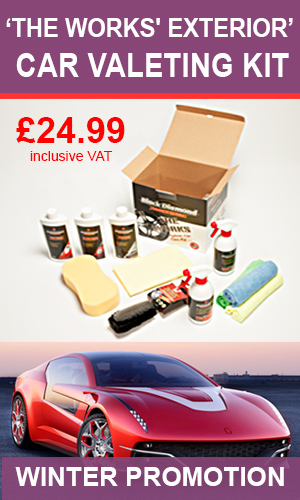 All our chemical and aerosol products are manufactured on-site in Little Wymondley, North Hertfordshire and our extensive range of Black Diamond products are used by professional Car Wash outlets, Valeting & Detailing specialists, Repair & Bodyshops and Home User all over the UK and European community. Our range covering all aspects of cleaning the interiors and exteriors of vehicles, our formulas have grown from years of technical experience and quality, and we pride ourselves on giving excellent service. Whether involved at the professional end of the industry or a home user, Black Diamond has a product to suit every valeting need from a comprehensive range of polishes and shampoos to more specialist needs such as a brake and clutch cleaner or fallout remover. Our in-house automated aerosol filling plant is capable of short and long production runs on contract basis. If you would like to know more about our products please visit our Trade Counter and take advantage of LOWER PRICES ON MOST ACCESSORIES. Visit our on-line shop or call us for your local stockist.